1. Grow 8-azaguanine-resistant P3X63Ag8.653 myeloma cells at a maximum concentration of 0.5 X 106/mL for 3 d; refresh medium 24 h before fusion. Harvest and wash the cells immediately before fusion, wash them twice in large volumes of serum-free medium (e.g., 50-mL conical tubes with ice-cold DMEM), and keep on ice until fusing with splenocytes. It is imperative that myeloma cells remain highly viable and completely free of protein in the medium. 2. Place and keep tube with 1.5 mL of 50% PEG solution in serum-free DMEM. In water bath or incubator at 37°C until fusion. 3. Euthanize the animal, collect as much blood as possible, prepare nonhemolyzed serum, aliquot, and keep at -20°C for further analysis. 4. Under aseptic conditions, remove the spleen, cut off the pancreas, and transfer the spleen into a sterile Petri dish with 10 mL of cold DMEM. Using sterile forceps wash the spleen in two additional Petri dishes containing 10 mL of cold DMEM. 5. Transfer the spleen into a sterile glass spleen crusher/homogenizer with 5-7 mL of cold DMEM, wait until it falls on the bottom, and move the pestle down to press hard on the spleen to squeeze out splenocytes. Repeat one or two times to remove all splenocytes in the suspension; the spleen will then acquire a whitish color. It is critical to avoid any circular motions of the pestle. 6. Using a wide-mouth 10-mL pipet, carefully remove the splenocytes suspension into a 15-mL conical tube and carefully pipet on the tube wall four to eight times to break down large cell clumps. Let the debris to settle down and collect debris-free splenocytes. At all times keep the suspension on ice and maintain high cell viability. 7. Wash twice at 200g for 10 min in a 50-mL conical tube with ice-cold DMEM. 8. 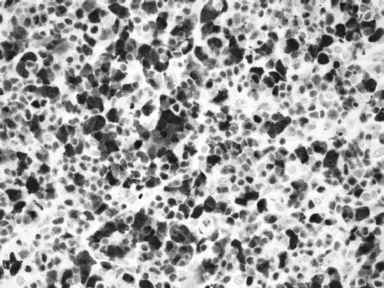 Resuspend P3X63Ag8.653 myeloma and splenocytes cell pellets in 10 mL of DMEM and calculate cell concentrations using a hemocytometer. Although a large range of splenocytes-to-myeloma cells ratios (from 1:1 to 20:1) and total cell numbers (from 5 X 107 to 5 X 108 of splenocytes and myeloma cells per tube) has been reported, the most commonly utilized protocols recommend a 5:1 ratio and approx 108 cells per fusion. 9. Combine 5 X 107 splenocytes and 5 X 107 myeloma cells in a 50-mL conical tube, resuspend in prewarmed (to 37°C) protein-free DMEM, and spin down in a bucket rotor centrifuge at 200g for 10 min to obtain a loose cell pellet that is evenly spread on the bottom of the 50-mL tube. 10. Quickly aspirate the supernatant and dissociate the cell pellet by gently flicking (up to five times) on the bottom of the 50-mL tube. Using a 2-mL pipet, over a period of 2 min, add 1 mL of the warm PEG solution drop-wise to the cell pellet, while gently tapping on the bottom of the 50-mL tube to constantly mix the cell pellet with PEG. Make sure that the full 1 mL of the viscous PEG solution is added. 11. Immediate after adding PEG, use a 10-mL pipet to drop-wise add 20 mL of warm (37°C) serum-free DMEM to the cells, while gently swirling the 50-mL tube after every 5 mL of DMEM added to the tube. After the first 20 mL of warm DMEM, slowly add another 20 mL of warm DMEM. 12. Centrifuge at 200g for 10 min, aspirate the supernatant using a 10-mL pipet, add 10 mL of warm (37°C) complete HAT medium with serum and supplements (see Subheading 2. ), gently pipet 10 times on the tube wall to form a uniform cell suspension, and transfer in a bottle containing 190 mL of warm (37°C) complete HAT medium. 13. Using a multichannel pipet with 0.2-mL tips, transfer the cells into 10 96-well flat-bottom plates, 0.2 mL per well. Gently stir the bottle after completing each 96-well plate to ensure even distribution of the cell suspension between the plates. 14. Incubate at 37°C in 5% CO2 in a humidified incubator, changing 0.1-0.15 mL of complete HAT medium once every 2 or 3 d. Under the described conditions, approx 50% of the wells exhibit clonal growth of hybridoma cells.